The Next American Orthodox Saint? Although she was American Eskimo and not Canadian, one of the best places to read about her is this Canadian Orthodox website. Among the hymns that are composed for any new saint is an Akathist. 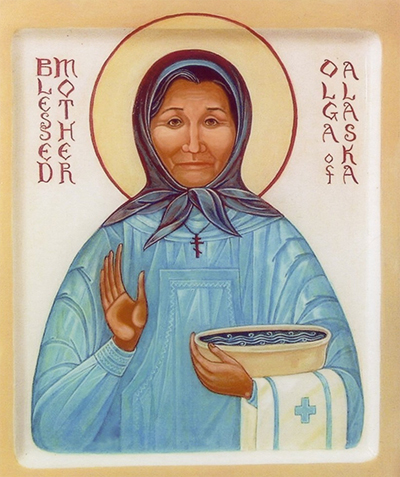 Here are excerpts from the beginning of the Akathist that has been composed for Blessed Olga Michael of Alaska. The full text can be read in the above website. The God who makes the moving curtain of the northern lights made you as a living light, shining in the far north and lighting up the desolate with His great beauty. Beholding this radiance, we your children lift up our voices and sing : Rejoice, Matushka Olga, healer of the abused and broken ! Rejoice, you that provided boots and parkas for the bodies of those in need ! Rejoice, you that still provide God’s grace for the souls of the afflicted ! Rejoice, strong consolation of peace for widows and orphans ! Rejoice, silent witness to the eternal Word ! Rejoice, Matushka Olga, healer of the abused and broken ! Categories: Sermons | Tags: canonization, new saint, royal priesthood of believers | Permalink.